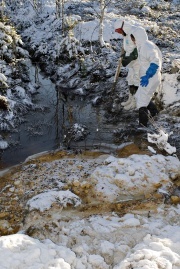 Since November 4, 2012 a cocktail of poisonous chemicals leaked from the Talvivaara mine in Eastern Finland to the surrounding rivers and lakes. An investigation of the Finnish Environment Institute found high levels of aluminium, cadmium, nickel, uranium and zinc in the released waste waters. In a big demonstration led by people from Eastern Finland on November 14, 2012 about 1,000 people demanded the mine's closure. A petition with some 18,000 signatures was handed over to the Minister of Environment. The number of signatures is still increasing - as of November 18 about 20,000 people had signed the petition. At the same time a small rally took place in Oulu. Only during the first day of the disaster, over 220,000 cubic metres of waste water have leaked from a gypsum waste pond at the Talvivaara mine in Kainuu. Some of the water has spilled to an area outside the mine. The leakage continued for at least ten days. The operator of the mine tried for weeks to close the leak. On November 8 they announced to have blocked a leak at its gypsum pond. Only half a day later a new leakage was reported. The same happened again with the "all-clear" message of November 14th, when it was announced again the leakage was eventually blocked - one week later the safety dam was reported to be leaking again. It is estimated that over 10,000 kilos of nickel and unknown amounts of uranium escaped the mine. A new spill started in the night of April 8, 2013 releasing some 350,000 cubic meters of waste waters only within the first day. 1.3 Breach of environmental permit? 2 Talvivaara: Vaasa District Administrative Court decision, dated March 3, 2013 - What does it mean? According to the Kainuu Employment and Economic Development Centre the gypsum pond was not supposed to be used for storing waste waters, and that there had not been any special permit for that. On November 8, Minister of Environment Ville Niinistö called the leak a "serious environmental crime". For years local people had accused Talvivaara to have extracted hundreds of tons of uranium a year without permission. For several days the Talvivaara company was not able to locate the site of the leak. Since the beginning of the catastrophe, the mine has discharged hundreds of thousands of cubic metres of toxic effluent into the nearby environment. According to a local newspaper some 4,000 cubic metres of waste water escaped the Talvivaara mine per hour. Greenpeace called it "Finland's biggest chemical catastrophe in history". The mine has leaked heavy metals like cadmium and nickel into its surroundings and nearby lakes. The uranium concentration in the effluent has risen by 100-200 times its normal level in the bottom and surface waters. Military and civil helicopters were in operation to plug the leaks in the waste water dam. "Helicopters are used to dump neutralizing calcium into the waste water, as well as moving concrete and patching material to leakages" explained the news company YLE. Some 150-200 people were busy to block the leaks and to build a safety dam, said Talvivaara Head of Communications Olli-Pekka Nissinen. Also soldiers from the Kainuu Brigade and local volunteer fire fighters were involved to the rescue activities. According to the Finnish authorities, "pollutants in nearby waterways are at levels that may cause the death of fish and affect plants and bottom-dwelling organisms". Although the the Finnish Radiation and Nuclear Safety Authority claimed the released uranium would not pose a threat to neither environment nor humans, they at the same time admitted it to be a potential health risk when it makes its way into drinking water. Chair of the parliament’s Environment Committee Matti Korhonen said on November 14 authorities should prevent the mine from resuming operations. On November 13, 2012, it was reported that STUK had detected uranium levels in water samples at 350 microgrammes per litre, while the recommended limit is 100 microgrammes. The company's operation at the Talvivaara mine were shut down after the disaster. Though the company appealed to the authorities to receive a permission for re-starting the business, officials stated this would not happen soon. First investigations have to be taken to understand the causes of the catastrophe and to investigate on the violations of law committed by the company. Such an inspection by the Finnish Safety and Chemicals Agency (Tukes) and Kainuu centre for Economic Development,Transport and the Environment (KAIELY) took place on November 19, 2012 - a delegation of independent observers was prevented from joining the inspection. November 22, People's Movement for the Lakes and Rivers informed about a new leakage found in the safety dam. According to them, Talvivaara Mining Company Plc started emergency liming with help of two helicopters dropping the lime from 300-500 kg containers. People's Movement for the Lakes and Rivers reported again the Lumijoki river carrying a foul stench and a strong odour of sulphur; the color of the flowing water down below from the dam was described to be alarming as in the beginning of the gypsum pond leak: brownish dark yellow. KAIELY played down the incident speaking about "seeking" which wouldn't be seen as a threat. Eventually the government admitted the new leak. People's Movement for the Lakes and Rivers criticized the government's perspective of a "stabilized situation", as it was obviously since the beginning that the "safety dam" and the "back-up pond" wouldn't provide a "stabilized situation". At least 100 hectares (approx 250 acres) of marshland, streams, lakes and ponds have been polluted by the discharges of waste waters containing uranium and heavy metals. Through heavy application of lime up to a thousand kilogrammes of liquid uranium has accumulated as sediment in the grounds and vegetation of the area. The uranium and the heavy metals such as nickel are about to enter the Vuoksi water system, where they could contaminate 1,000 million cubic metres of water over the level of environmental danger. Talvivaara experienced another leakage releasing releasing some 7,000 cubic meters of waster waters per hour - in total some 350,000 cubic meters are said to have leaked out during the first day. The new spill started in the night of April 7th, 2013. As before, the company is downplaying the issue: Harri Natunen, head of production at Talvivaara, claimed that the new leak is not as serious as the one that shut down production in November. The Talvivaara nickel mine gypsum pond spill of November 2012 has been reported to have involved 1 million cubic meters of contaminated liquid (1,000,000,000 litres). Based on the pond dimensions figures between 1.4 and 3 million m³ have also been estimated. A substantial part of the spill gathered in emergency ponds which mainly consist of swamp areas. There are major concerns because the safety ponds have leaked, which was discovered and documented by environmentalists; and as the ponds lack any bottom lining, thus are not isolated from regional ground waters. At least 20,000 cubic meters of the spill entered in the northern Oulujoki-waterway. The major leak to the south through the lake Ylä-Lumijärvi in the major East Finland Vuoksi- waterway included at least 200,000 cubic meters of waste water. Large amounts of lime (calcium oxide, CaO) have been dumped by helicopters to a swamp and river in the southern leak area in an attempt to precipitate some of the metals. Substantial amounts of uranium and metals have been measured from a contaminated land area of approximately 5 hectares located below the last emergency pond. The highest uranium concentration measured by the state radiation authority has been 260 mg/kg, and about 200 mg/kg dry weight by environmental organisation with the only heavy metal analysis of the material. The legal limit of radiation waste is 1,000 Bq or 40 mg uranium/kg, but the authority is reluctant to classify the waste material as radioactive. Classification would possibly lead to legal issues with the mine environment and process permits. Only an environment permit for uranium “recovery” factory has been applied (under review), it is not for an enrichment process including radiation risks. The land precipitated colourful slurry (“mönjä”) material would appear to be a minor part of the spill as the pH of the leak was about 4-5. After publication of the presence of “mönja” by local environmental organisations and some protests, Talvivaara has started an operation to clean the region. The concentrations of the major contaminants listed here are based on a citizen sample by local resident Ari Korhonen, and later official measurement by the inspection authority, which are similar. Cadmium levels are based on official figures. The volume is assumed as 220,000 m³. The further spill risks in the emergency ponds include even 10 fold larger amount of chemicals. Even though part of the material may be rescued from the land to be cleaned, the volume estimates by Talvivaara are likely to be too low. The amounts of contaminants are in tons except cadmium, for which the 4.2 kg is a substantial amount. There was 50, 2, and 2.9 grams per litre of sulfate, aluminium and manganese, respectively, and the sulfate quantity was 11 thousand tons. Considering the environmental safety Talvivaara has very high maximum concentration limits in its environmental permit (currently under review by Finnish authority, and by EU commission) for nickel and zinc, 1 and 2 mg/litre. It has no permit for uranium and cadmium (under review). The permit includes estimates of aluminium, sulfate, and manganese, which have been considered as binding norms for Talvivaara, when previous sulfate emissions were considered. Table includes column for how many fold the spill exceeded the concentrations in the permit. Breach of permit should lead to legal consequences to persons responsible, and the company is liable for damages. Nickel and zinc are toxic for the water nature at concentrations of some micrograms per litre. The EU quality norm for nickel is 21 micrograms per litre for inland surface water. The environmental effects of uranium are still not fully known, a review of EU SCHER science commission mention a preliminary environmental limit of 0.1 micrograms per litre. Cadmium is an especially toxic heavy metal, which accumulates in the human body and in food chains. The EU quality norm of cadmium for inland surface waters is 0.1 micrograms per litre. Aluminium is acutely toxic to fish by blocking its gills. The highest toxicity is low acidic pH in the spill. Manganese is also toxic in waters and has reported to have neurotoxic effects in human at high amounts. The environmental safety limits used for aluminium and manganese are 27 micrograms and 1.2 mg per litre, respectively. The environmental standards, except of EU cadmium and the uranium value, were from table 3.4.1 of Australian government document. Sulfate accumulates in deep regions of lakes, and causes lack of oxygen and can be degrade to highly toxic hydrogen sulphide. A limit of 50 mg/litre is recommended to avoid disturbances in fish eggs. The spill contained e.g. toxic heavy metals cobalt about 0.5 mg/litre and chromium almost 1 mg/litre and fluoride 68 mg/litre. Comparative environmental standards from Finnish ministry of environment. Based on the environmental standards, the amount of water which can be contaminated over legal limits was calculated. One million cubic meters corresponds to a small lake with an area of 1 square km and depth of one meter (or e.g. 0.2 km² and 5 meter depth). A substantially big lake in the southern Vuoksi waterway is e.g. Syväri with about 500 million cubic meters volume. Using the quite strict environmental standards, the spill has a potential in both waterways to at least temporarily spoil many lake systems. Currently the major part of the spill is concentrated to deep parts of the first 2-3 lakes of both waterways. Measures to localise the waste to the lakes should be seriously considered. The concentrations and amounts of some key substances of the spill into the nature outside of the mine district, may have contaminated millions of cubic meters of inland surface waters. Compiled by Jari Natunen, PhD, Biochemist. Talvivaara: Vaasa District Administrative Court decision, dated March 3, 2013 - What does it mean? This information has been provided by Kainuu District of FANC (Finnish Association for Nature Conservation). The Vaasa Administrative Court of Finland (Vaasan hallintooikeus) has on March 4, 2013 given a decision against Talvivaara Sotkamo, Plc. The complaint was filed in June 2012 (and will be called the June 2012 decision here). In June 2012, the Kainuu Centre for Economic Development, Transport and the Environment (Kainuun Elykeskus) in Kajaani, Finland, which is in charge of monitoring the mine, allowed Talvivaara to invoke Article 62 of the Environmental Protection Act. The Article is meant to allow bypassing of the environmental permit whenever there is a major risk of a catastrophe caused by unexpected natural phenomena or other unanticipated disasters. The Article specifically precludes any problems caused by actions of the company. The environmental permit allows Talvivaara to relase 1.3 million cubic meters of neutralized water a year into the environment, as long as the water is first passed through a gypsum pond which captures some of the heavy metals. (The acidic water is neutralized with lime, and hence contains large numbers of sulphates, whose amounts are not controlled by the environmental permit. The sulphates are known to have already caused severe damage to the neighboring bodies of water). The Article was used in June 2012 to justify the temporary diversion of wastewaters past this critical gypsum pond. The diversion degraded the environmental performance of the overall system, and was in violation of the environmental permit. Even though the Article only permits shortterm deviations from the environmental permit, the diversion system is still in place as of March 2013. The court’s decision was based on these findings. To make the problem worse, the gypsum pond in question suffered a leak in November 2012 in part because it had been used to store contaminated and acidic metal raffinate from the bioleaching process (strictly against the environmental permit or any permission from the ELYkeskus). The gypsum pond has been only partially opened for use. It is not clear how Talvivaara will be able to achieve compliance with the environmental permit, when a critical part of the system is out of commission. This court decision is only the first in a series of complaints which have been raised against the mine. Of particular interest here is that Talvivaara has invoked Article 62 a total of six times, four of them after the case related to this decision (March 2012, June 2012, August 2012, November 2012, January 2013, and February 2013). The November 2012 case is related to the leak from the gypsum pond, and is being investigated by police authorities. In the most current case, in February 2013, Talvivaara invoked Article 62 in order to rid itself of excess water in the mine, which it claims to be the result of excess rainfall in 2012 as well as problems with the bioleaching process. Talvivaara claims to have at least 7 million cubic meters of excess water, although the figure is difficult to verify. Talvivaara applied to relase 3.8 million cubic meters before June 2013; the ELYkeskus is allowing 1.8 million cubic meters to be released, decisions on the other 2 million having been escalated to another authority. A total of nine entities (communal authorities, environmental groups, and private individuals) have filed complaints against the February 2013 decision to allow use of Article 62. The case is being adjudicated urgently. A key thrust of the complaints is that just as in June 2012, the requirements to use Article 62 are not being fulfilled. The complaints thus demand that the diversions be stopped immediately, and the mine be forced to operate in compliance with the environmental permit. The June 2012 decision can be appealed to the Supreme Administrative Court, and thus it does not require Talvivaara to stop releasing the waters immediately. However, if the decision were to be enforced and the mine forced to stop its violation of the environmental permit, it would cause serious problems in the waste water management of the mine. In particular it would raise doubts about the usefulness of the new diversions, since almost half of the total diversion capacity would be lost. The new diversions would thus cause major damage to the environment, but little benefit to Talvivaara. Talvivaara has so far not commented on the June 2012 decision, claiming that it has no bearing on the current status of the mine, or especially the diversions of February 2013. 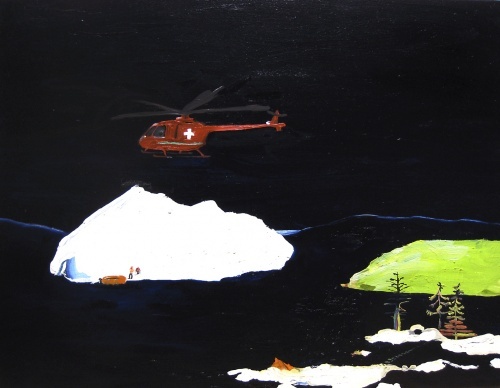 The Vaasa Administrative Court has on April 2, 2013 given an interim decision on the emergency diversions that the Talvivaara mine invoked under Article 62 of the Environmental Protection Act. The mine claimed that emergency diversions are necessary to get the mine under control. The Kainuu ELY Center ruled that the diversions were legal. The Administrative Court has now overruled that decision and issued a temporary partial injunction, effective immediately. A final ruling will be made later. The injunction limits the amount of water that can be diverted southwards to 7% of the water flow of the Kalliojoki river. This is the maximum amount allowed by the normal environmental permit. As such, it implies that as of now, no water in excess of the normal 1.3 million cubic meters can be discharged to the south of the mine. At the eastern Finnish Talvivaara Europes largest nickel open cast mine is situated. Since 2008 the mining is in operation 24 hours a day and moved more than 30 millions of tons of soil. In an area as big as 60 square kilometers mining, crushing, chemical treatment and extraction takes place. Besides nickel also big amounts of uranium, copper and cobalt are produced. In February 2011 he Canadian uranium mining company Cameco made a contract with the Talvivaara operator to construct an uranium extraction facility with a capacity of 350 tons uranium per year. The last years, particularly in summer 2012 a movement against the uranium mine was established in Finland. However, the catastrophe in Talvivaara gathered an unexpected number of people to demonstrate to stop the operation and extension of the mine. This page was last modified on 6 May 2016, at 12:33. This page has been accessed 116,054 times.